Let's face it, at this point in the game, there are not many challenges left for Ronda Rousey. She has seemingly beat every legitimate fighter in the division at this point. That said, there are still a couple of enticing fights that Rousey could secure. Although she finds herself staring down a third meeting with Miesha Tate in the near future, there are a couple of match-ups that could make sense for her going forward before she effectively clears out the division. So, who are the three ladies that Rousey must beat before declaring the division cleaned out? Let's take a look and examine these potential suitors. Of the three women listed, she is probably at the end of the line. That is because she is still young in her MMA career and improving. And although she has been a tad underwhelming since coming to the UFC, Holly Holm is still somebody that would be an interesting fight for Ronda Rousey to take before 135 is cleaned out. A boxing world champion, Holm has some of the best striking in women's MMA. She evidenced that before she ever stepped foot in the UFC, knocking out opponent after opponent. Despite a lackluster premiere in which she narrowly beat Raquel Pennington, Holm looked much more relaxed and at ease in her most recent bout. There, she dominated Marion Reneau to put some wind back in her sails. If she can pick up a win or two more, there is no doubt she will be in line for a title shot. This is especially because Rousey has already dominated pretty much everybody else in front of her in the rankings at this point. If there is a "most improved fighter award" for the UFC women's bantamweight division, chances are Amanda Nunes would have taken that award. In seeing her most recent performances, that may have parlayed her into the title picture and earned her a potential bout with the champion, Rousey. The turning point for Nunes came last weekend when she laid waste to former title challenger and Olympic silver medalist wrestler SaraMcMann. Not only did she dominate the American, but Nunes finished her with an impressive rear-naked choke that put her in the minds of most fans. In looking ahead of her in the rankings, ladies like Miesha Tate, CatZingano, McMann, Sarah Kaufman and others have had their changes and failed. Nunes has not had her chance, and given her recent performances, she should get her shot before the division is declared cleared out. Yes, this is the fight fans want to see. I won't go on writing about how she's the only challenge left for Rousey because every writer and his mother have written an editorial about how Cris Justino is the only challenge left for Rousey and how the fans need this fight. We get it. 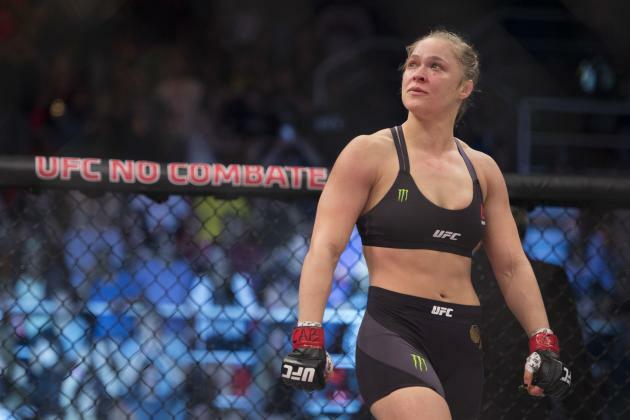 It's the best fight left for Rousey and a potential box-office explosion for the UFC. Here's the thing though. Before Justino gets her fight with Rousey, it makes sense that she makes the 135-pound weight class once and fights there to prove she can make it. Imagine the disaster that would come if Justino missed weight againstRousey, especially if she skips the process of doing it once before withInvicta (or the UFC). It would be a massive money loss, a let-down to the fans and an absolute shame to what would be a truly special fight. Until then we wait, knowing Cyborg lurks in the shadows.